While I am grateful for the efforts of those who crafted the proposal, I find it unacceptable and unworkable in its present form. Perhaps it needs to be clarified that we have not requested someone to serve as “the Presiding Bishop’s designated pastor” to us; we have appealed for an alternative primate. Nor has this appeal been made to the Presiding Bishop, but to the Archbishop of Canterbury and the Primates of the Anglican Communion. We expect a suitable response from them at the Primates’ Meeting in February. This new proposal is deficient in that it seeks to reinforce the PB’s authority over us rather than provide an acceptable alternative. We cannot accept a Primatial Vicar appointed by her and accountable to her, who “could” function for her only when so delegated by her. In addition, the provisional nature of the proposal does not meet our needs for a long-term solution to our irreconcilable differences. This morning ENS carried a story about the proposal Presiding Bishop Jefferts Schori and her episcopal advisors have cobbled together to accommodate the request of seven dioceses for Alternative Primatial Oversight (such as my own diocese of Fort Worth). The full text of the proposal is now available. You will quickly note that the proposed "primatial vicar" seems to be nothing more than a stand-in for the Presiding Bishop at consecrations of bishops, and has absolutely no power other than what the Presiding Bishop might choose to delegate to him. The Presiding Bishop would pick this "primatial vicar" after nothing more than "consultation" with the Archbishop of Canterbury, and the "vicar" would be answerable to the Presiding Bishop. The vicar would report to a committee, half of the membership of which would be loyal to the Presiding Bishop and the General Convention and only one member of which would be a representative of the APO appealing dioceses. All REAL authority would remain entirely with the Presiding Bishop. Needless to say, this is a far cry from what the APO appealing dioceses have in mind, though I suppose it may impress some folks like Bishop Stanton of Dallas as "reasonable." Look for a uniform rejection from the orthodox, both at home and abroad. Bishop Duncan of the Network has already pointed out the obvious shortcomings of this proposal. The statement that follows is found on the diocese of Pittsburgh's web site. The Episcopal News Service today released a proposal responding to the request by seven Episcopal dioceses for Alternative Primatial Oversight (APO). 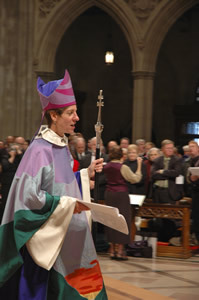 It suggests that a “primatial vicar” be appointed by Presiding Bishop Katharine Jefferts Schori to serve as her “designated pastor in such dioceses.” The “primatial vicar” would be accountable to Presiding Bishop Jefferts Schori and perform those functions she chooses to delegate, such as episcopal ordinations. “We are heartened that the national leadership of The Episcopal Church has realized the time has come for structural change. We will study this proposal,” said Bishop Robert Duncan, bishop of Pittsburgh and moderator of the Anglican Communion Network. “However, at first glance what is proposed is neither primatial, nor oversight, nor is it an alternative to the spiritual authority of one who, by both teaching and action, has expressly rejected the Windsor Report and its recommendations. This is obviously not what was asked for.” Bishop Duncan also observed that what is proposed is in fact less than what was offered and rejected at the first meeting held in New York during September. Bishop Duncan reiterated his commitment to find a mediated solution to the crisis in The Episcopal Church. “We really do want to talk about all the issues. We want to protect everyone who is unable to travel down the path the majority of The Episcopal Church has clearly chosen, not just those in dioceses that have requested APO. We want to have this conversation and find a way forward that allows all of us to get on with our mission. We are committed to remaining in the mainstream of the Anglican Communion as we proclaim the faith once delivered to the saints,” he said. When Pope Benedict XVI attended the Divine Liturgy celebrated by the Patriarch of Constantinople, Bartholomew I, yesterday the patriarch's homily struck several positive notes about the prospect for restored "full communion" between Rome and the Eastern Orthodox Churches. This is a portion of the homily, with boldfaced highlights by me. The entire text may be found here. we recognize that the rule of prayer is the rule of faith (lex orandi lex credendi), that the doctrines of the Person of Christ and of the Holy Trinity have left an indelible mark on the liturgy, which comprises one of the undefined doctrines, "revealed to us in mystery," of which St. Basil the Great so eloquently spoke. This is why, in liturgy, we are reminded of the need to reach unity in faith as well as in prayer. Therefore, we kneel in humility and repentance before the living God and our Lord Jesus Christ, whose precious Name we bear and yet at the same time whose seamless garment we have divided. We confess in sorrow that we are not yet able to celebrate the holy sacraments in unity. 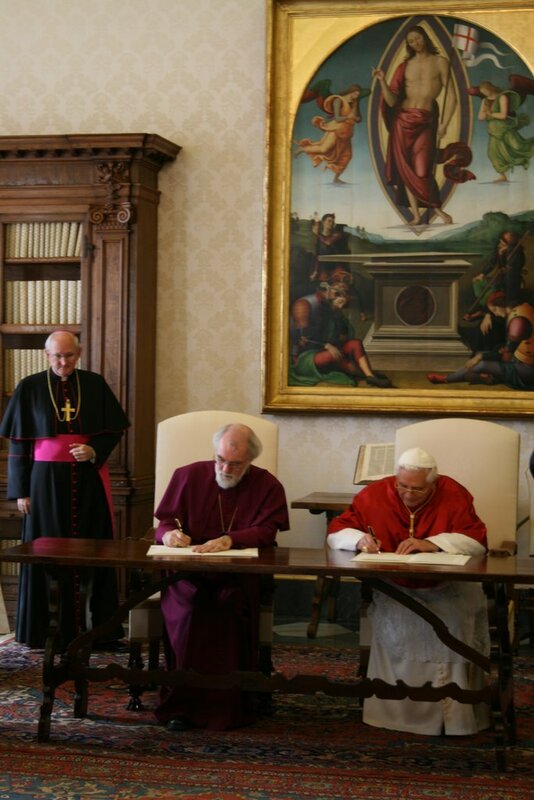 And we pray that the day may come when this sacramental unity will be realized in its fullness. And yet, Your Holiness and beloved brother in Christ, this con-celebration of heaven and earth, of history and time, brings us closer to each other today through the blessing of the presence, together with all the saints, of the predecessors of our Modesty, namely St. Gregory the Theologian and St. John Chrysostom. We are honored to venerate the relics of these two spiritual giants after the solemn restoration of their sacred relics in this holy church two years ago when they were graciously returned to us by the venerable Pope John Paul II. Just as, at that time, during our Thronal Feast, we welcomed and placed their saintly relics on the Patriarchal Throne, chanting "Behold your throne! ", so today we gather in their living presence and eternal memory as we celebrate the Liturgy named in honor of St. John Chrysostom. Thus our worship coincides with the same joyous worship in heaven and throughout history. Indeed, as St. John Chrysostom himself affirms: "Those in heaven and those on earth form a single festival, a shared thanksgiving, one choir" (PG 56.97). Heaven and earth offer one prayer, one feast, one doxology. The Divine Liturgy is at once the heavenly kingdom and our home, "a new heaven and a new earth" (Rev. 21.1), the ground and center where all things find their true meaning. The Liturgy teaches us to broaden our horizon and vision, to speak the language of love and communion, but also to learn that we must be with one another in spite of our differences and even divisions. In its spacious embrace, it includes the whole world, the communion of saints, and all of God's creation. The entire universe becomes "a cosmic liturgy", to recall the teaching of St. Maximus the Confessor. This kind of Liturgy can never grow old or outdated. The only appropriate response to this showering of divine benefits and compassionate mercy is gratitude (eucharistia). Indeed, thanksgiving and glory are the only fitting response of human beings to their Creator. For to Him belong all glory, honor, and worship: Father, Son, and Holy Spirit; now and always, and to the ages of ages. Amen. 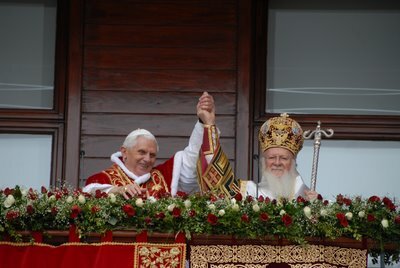 Truly, particular and wholehearted gratitude fills our hearts toward the loving God, for today, on the festive commemoration of the Apostle founder and protector of this Church, the Divine Liturgy is attended by His Holiness our brother and bishop of the elder Rome, Pope Benedict XVI, together with his honorable entourage. 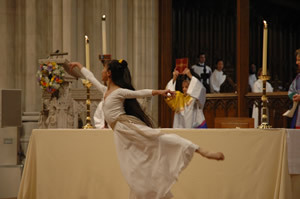 Once again, we gratefully greet this presence as a blessing from God, as an expression of brotherly love and honor toward our Church, and as evidence of our common desire to continue – in a spirit of love and faithfulness to the Gospel Truth and the common tradition of our Fathers – the unwavering journey toward the restoration of full communion among our Churches, which constitutes His divine will and command. May it be so. Pope Benedict's comments in response (with boldface emphasis added) may be found here. Simon Peter and Andrew were called together to become fishers of men. This same task, however, took on a different form for each of the brothers. Simon, notwithstanding his human weakness, was called "Peter", the "rock" on which the Church was to be built; to him in a particular way were entrusted the keys of the Kingdom of Heaven (cf. Mt 16:18). His journey would take him from Jerusalem to Antioch, and from Antioch to Rome, so that in that City he might exercise a universal responsibility. The issue of the universal service of Peter and his Successors has unfortunately given rise to our differences of opinion, which we hope to overcome, thanks also to the theological dialogue which has been recently resumed. This faith in the redeeming death of Jesus on the cross, and this hope which the Risen Christ offers to the whole human family, are shared by all of us, Orthodox and Catholics alike. May our daily prayer and activity be inspired by a fervent desire not only to be present at the Divine Liturgy, but to be able to celebrate it together, to take part in the one table of the Lord, sharing the same bread and the same chalice. May our encounter today serve as an impetus and joyful anticipation of the gift of full communion. And may the Spirit of God accompany us on our journey! Bishop Schofield of San Joaquin has responded to PB Jefferts Schori just two days before that diocese's convention may vote to initiate changes in their constitution and canons that will end their relationship to the national Episcopal church (though as Bishop Schofield points out here, it would take ratification by another diocesan convention for this change to take effect). I have highlighted some important passages. Greetings in the name of our Lord and only Savior Jesus Christ. I am in receipt of your letter to me and wish to make clear from the outset that I have always remained faithful to my vows as an ordained bishop in the one, holy, catholic and apostolic Church. At my consecration, I vowed to “guard the faith, unity, and discipline of the Church of God.” I was charged by my chief consecrator to “Feed the flock of Christ committed to [my] charge, guard and defend them in his truth, and be a faithful steward of his holy Word and Sacraments.” I carry out my vow by defending and propagating “the historic Faith and Order” which The Episcopal Church commits to upholding in the preamble of its own Constitution. In 2003, the General Convention committed itself to a theological path that is irreconcilable with the Anglican faith this Church has received and has torn the fabric of the entire Communion. The Primates repeated calls for repentance have not been heeded. More than half of the Primates and Provinces of the Anglican Communion have declared themselves to be in impaired or broken communion with The Episcopal Church. Beyond our Anglican Communion, relations throughout Christendom have been profoundly strained. 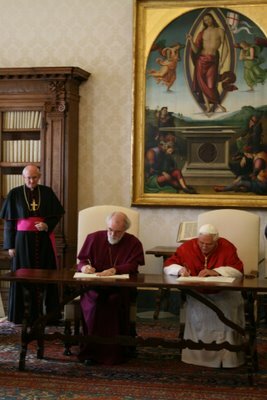 With obvious reference to innovations and novelties introduced by The Episcopal Church, last week Pope Benedict XVI publicly stated to Archbishop Rowan Williams that recent developments, “especially concerning ordained ministry and certain moral teachings,” have affected not only the internal relations within the Anglican Communion but also relations between the Anglican Communion and the Catholic Church. The Episcopal Church, as an institution, is walking a path of apostasy and those faithful to God’s Word are forced to make painful choices. At a diocesan level, the choice is between continuing membership in an unrepentant, apostate institution or following Holy Scripture and the Anglican faith. Whether or not the Diocese of San Joaquin will continue its institutional membership in The Episcopal Church is a choice that will be made by the people and the clergy and not by me. They will express their collective will as provided in the diocesan governing documents which were approved by the General Convention when the diocese was first admitted to membership. It is important to point out that the vote at the Diocesan Convention in December 2006 is neither final nor irrevocable. Should the Constitutional amendments being proposed pass the “first reading,” then the diocese will simply have positioned itself to make a final decision at a second consecutive Annual Convention in 2007 if that proves God’s call. Under our diocesan constitution, the second and final reading is automatically scheduled for October 2007. The setting of the exact date may be advanced or delayed by the bishop. There are some significant factors that would influence such a decision. First, at the meeting with the leading Primates of the Global South in Virginia, November 15-17 this year, the Global South Primates Steering Committee encouraged us by supporting our faithful stand and commitment to Christ, and they expressed a desire to be of help to us to relieve our untenable position. 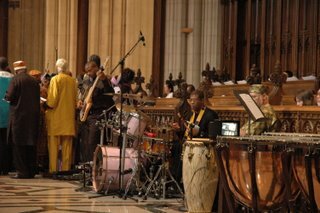 They have promised assistance, the form of which they will bring to the entire Primates meeting scheduled for Dar Es Salaam, Tanzania, in February 2007. In the meantime, in keeping with the goals of the Windsor Report and positioning ourselves to accept the Primates’ help, we are responding to the Primates who called upon us to remain flexible until the details are worked out. An additional consideration was your letter to me. I believe you have shown wisdom and restraint by not issuing an ultimatum. Instead, you have invited further discussion which could possibly lead to some degree of reconciliation. In recognition of what you have proposed, I, too, will exercise restraint by not advancing the date of what could be an historic and final act. However, should proceedings be instituted against me as threatened in your letter, I would not feel obliged to exercise restraint. My prayer is that neither of us takes action which upsets the delicate balance which now exists until the Primates have given us direction at their February 2007 meeting. Until then, powerful forces will be at work that will ultimately shape the future. I pray that God’s will be revealed to us all. You may be assured of my prayers for the Holy Spirit’s wisdom and guidance. The entire letter may be found on the diocese of San Joaquin's web site. In addition, on the same diocesan web site one may find Bishop Duncan of Pittsburgh's letter of encouragement to the diocesan convention of San Joaquin in his capacity as Moderator of the Network. "As the Clergy and People of the Diocese of San Joaquin face into your Annual Convention of 2006, I want you to know that the whole Network is praying for you. Stay the course. You are doing important work in establishing that the diocese is the fundamental unit of the catholic church. While you are engaged in a "first reading" and therefore not actually bringing any change for the moment, your determination makes clear your commitment to the Gospel above erring councils and positions. You will be poised to make the changes by a second reading if that proves God's call." O Holy Father from Whom all blessings flow, we come before You in meekness and bow down: humbly we beseech You to look kindly upon the meeting of Patriarch Bartholomew, Archbishop of Constantinople, and Pope Benedict, Pontiff of Rome. For too long, there has been division and alienation in the Church, when there should have been the unity of the Body of Christ. We beg Your mercy and wisdom, O Lord, to provide for the welfare of the holy churches of God and for their union. Let this occasion of fellowship be for the healing of old disputes. In Your infinite power, protect these Shepherds of the Great and Holy Pasture of Christ. Shield them, and all who attend, from the peril of harm. And in Your matchless grace, establish a bright new work in these latter days, so that the world might see the Face of Christ; so that men and women might repent, believe on the Lord Jesus Christ, and be saved in the Apostolic Church of God. For these supplications, we humbly beseech You, Holy Father, hear us and have mercy. From the American Carpatho-Russian Archdiocese. Bishops Iker and Duncan Have Had Enough "Conversation"
We believe the situation has deteriorated significantly in recent weeks with threats of lawsuits against bishops appealing for APO and of declaring “vacant sees.” We note that we are now tagged as “problem dioceses” and that we will continue to be monitored by the property task force headed by Bishop Sauls. We also note that this task force is going to cultivate relationships with persons in our dioceses who oppose the position taken by our diocesan conventions. Such posturing is meant to intimidate us and does not promote dialogue and conversation about the matters before us. I have been advised that legal counsel should accompany me to any future meetings with representatives from 815 or the General Convention. Should you elect to proceed with your meeting on Monday, please know that you will be in our prayers and that Bob and I wish you good success. "It is well done." ... "It re-proposes this event which changed history with realism but also with a sense of great respect of the mystery of the nativity. It is a good cinematic event ... the judgment is positive." At least one conservative RC blogger questioned whether St. Mary experienced the labor pains the film depicts, on the grounds that she should not be under the "curse of Eve" in light of the RC dogma of the Immaculate Conception (though considering Rev 12:2 I think a traditionalist Catholic can at least say it is possible that the BVM experienced such pains). Other than that one quibble, this film seems able to appeal to both evangelicals and Catholics in equal measure. And as someone who considers himself both an evangelical and a Catholic, I very much look forward to seeing it this weekend. Yesterday I was dining with a couple of priests and an aspirant in the diocese of Fort Worth, and the topic of possible Prayer Book revision within the Network came up. I think most traditionalist Anglicans would concur that there are some problems with the 1979 Prayer Book, though I use it without serious qualms myself. I was told that there have been discussions about producing a new BCP to handle these perceived difficulties of the 1979 Book. Apparently these Network liturgists (if they have undertaken or will soon undertake this work) would use the C of E's 1662 Book of Common Prayer as the basis for the revision. While one of my lunch partners yesterday thought this would be a step backward (presumably because it is too "Protestant" for his tastes), I spent considerable time with the 1662 BCP this morning and have concluded that this would make a fine foundation for a new Book. There is much to be said for a return ad fontes for Anglican worship. In any proposed new North American province, a new common liturgy would help to bind Evangelicals and Anglo-Catholics together (providing that this new Book allowed for the full range of expression of traditionalist Anglican worship practices, as I am sure it will). A modernized and adapted BCP based upon the 1662 Book would reflect our common heritage as Anglicans and emphasize what we have in common with other orthodox Anglicans around the world (since the 1662 Book is the liturgy we have in our common heritage), cementing our relationships with these overseas brothers and sisters. With this in mind I reviewed the proposed theological statement produced by the Common Cause Partners, the new alliance of orthodox Anglicans in North America created by the Network and various continuing Anglican jurisdictions. The proposal was amended to take into account the concerns of many Anglo-Catholics (particularly with regard to the use of the Thirty-Nine Articles as a basis for discipline). I find this willingness of accommodate co-religionists across the Evangelical/Catholic divide to be a great encouragement. It appears we can in fact all work together for a common orthodox future. As amended I find this a fine statement, one which all but the most Tridentine-leaning Anglo-Catholics should be able to endorse. The statement may be found here. You will not be surprised by the content, but give it a read anyway. It may be found here. The Global South Steering Committee, at the request of the Global South Primates, recently met with bishops and representatives of eight Anglican Communion Network Dioceses who have appealed to the Archbishop of Canterbury and the Global South Primates for various forms of Alternative Primatial Oversight. Representatives of other Windsor-compliant Dioceses and the more than one hundred congregations that are now separated from the Episcopal Church also joined us. Respective presentations were received expressing the increasingly difficult and, in some cases, untenable situations in which they attempt to live out apostolic faith and historic order. We were distressed to hear of the legalistic and autocratic environment in which some now find themselves as they seek to remain faithful Anglicans within The Episcopal Church. The Steering Committee will be making its report and recommendation to the Global South Primates when they next meet and will also be sharing them with the Archbishop of Canterbury. Deeply touched by the oftentimes painful and gravely disconcerting testimonies that we heard, the Global South Steering Committee feels morally and spiritually compelled to reassert its deepest solidarity with these orthodox and faithful bishops and representatives. We express our unequivocal support and heartfelt recognition for their faithful stand and struggles. We urge all faithful members and parishes of these concerned dioceses to remain steadfast in their commitment to Christ as our one and only Lord and Savior during these turbulent days. We will do all in our power to bring about the desired outcome of the “Windsor process” so that the refined global Anglican Communion can be faithful to its vocation as part of the “One, Holy Catholic and Apostolic” Church. May God bless the deliberations of the Global South Primates and the "refinement" of the Anglican Communion. For yet "in a very little while, the one who is coming will come and will not delay; but my righteous one will live by faith. My soul takes no pleasure in anyone who shrinks back. From the letter to the Hebrews, in the name of the Father, and of the Son, and of the Holy Spirit. Amen. Every Sunday we affirm in the Nicene Creed that Christ Jesus “will come again with glory to judge the living and the dead, and his kingdom will have no end.” Without doubt the world “will see the Son of Man coming on the clouds of heaven with power and great glory.” With His final triumph the Lord of all creation will finally annihilate sin, and death, and every other form of evil that infests our present age. This has always been the faith of the Church, and it will remain so until He returns. We must not forget, however, that our Savior also warned us that much will remain unknown to us about the End of Days. 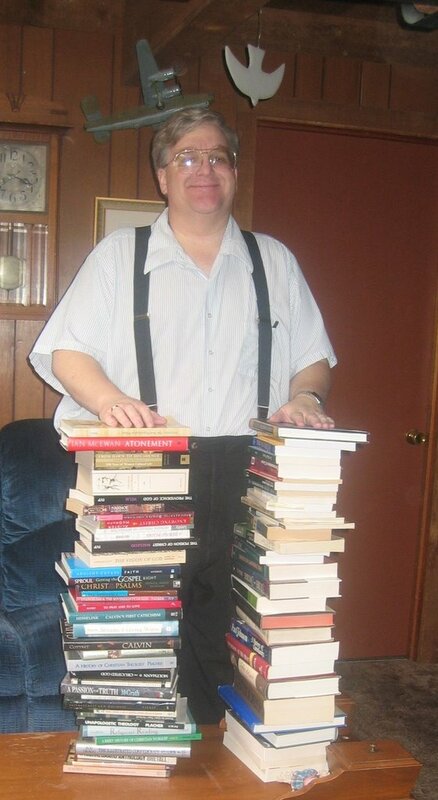 “Concerning that day and hour no one knows,” Jesus said, “not even the angels of heaven, nor the Son, but the Father only.” While there is no shortage of TV preachers, potboiler novels, and second-rate films that purport to describe the precise time and character of our Lord’s Second Coming, these speculations are neither Biblical nor consistent with Sacred Tradition. It is a fact that our Lord Jesus will return in glory, perhaps before lunch today, perhaps a million years down the road. But attempting to decode the Revelation to St. John using The New York Times or The Bible Code as a key cannot work. If the incarnate Son of God did not know the details of the end of the age, then you and I will certainly never know. But if we must remain ignorant of the exact nature and timing of the Final Victory of God why bother with today’s Gospel lesson? Because, friends, the End of Days has in fact come—for us--right here, right now. The words of Christ we just heard resonate with our own time just as much as they do with Judgment Day. Can anyone who is aware of the present assault on the Catholic faith and apostolic order of Christ’s Church doubt that we are seeing a “desolating sacrilege set up where it ought not to be”? Or travel to Barnes & Noble and examine the “Spirituality” section. 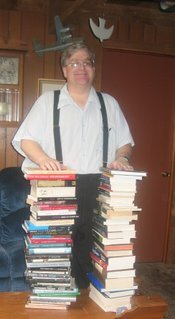 You will find a legion of books laying out the author’s vision of the “historical Jesus,” a man-made Jesus that invariably suits the tenor of our times better than the Word-made-Flesh we meet in the Holy Scriptures. Brothers and sisters, “if anyone says to you, … 'Look! Here is the Messiah!' or 'Look! There he is!' --do not believe it. False messiahs and false prophets will appear … to lead astray, if possible, the elect.” Never were truer words spoken. Twenty-first century America specializes in the “desolating sacrilege” business! 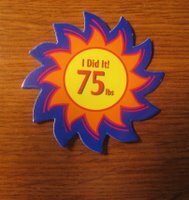 But--thanks be to God!--for you and me the Lord has cut short these days. For those who have repented and believed the Good News, those regenerated by the Holy Spirit in Baptism and marked as Christ’s own forever have slipped the shackles of this present age. The rules of “the world that is passing away” no longer quite apply. We are still in that world, but we are no longer of it. We still taste of death but we do not truly die, “for the hour is coming and now is when the dead will hear the voice of the Son of God, and those who hear will live.” With Christ’s call to us the present and the future are collapsed into one, and the result is eternal life. The Lord’s gift of eternal life both transcends time and brings about its consummation, for what we call “the End of Time” is simply another name for “the goal of history.” And the ultimate goal of history was ordained by God before the foundation of the world: we were destined to abide with Him in blessedness forever through Christ Jesus our Lord. This altar is a place where time and eternity intersect, where the commonplace and the sacred meet. If we have eyes to see it, Here is Jacob’s ladder, where angels and archangels and all the company of heaven descend to sing the Sanctus with us. Here is Mount Sinai, where the people of God are forged by the blood of the covenant. Here is the blood-soaked wood of Calvary and the bare stone slab of Easter. Here is the Judgment Seat of Christ and the Lamb’s Book of Life. Here is the Heavenly Banquet and “the medicine of immortality”. The altar of the Living God is a singular place where time as we know it loses its meaning and the barrier between this world and the next becomes tissue paper thin. On this altar the whole of salvation history is brought to a point of radiant intensity and the most precious substance imaginable—the very blood of God—enters time and space. And there is enough genuine Life in one drop of that precious blood to empty every grave on the planet. No wonder Daniel tells us today that the righteous “who sleep in the dust” will shine like stars through faith! Who wouldn’t shine in the presence of such glory? Let us all treasure up that in our hearts as our Reverend Fathers raise the chalice and host, and we behold the Lamb of God, the Savior of the world, the climax of history, and the End of Days. Come, let us adore Him. In the name of the Father, and of the Son, and of the Holy Spirit. Amen. The entire address may be found here. The one assurance I can give you in the midst of much that is uncertain is this: whatever may happen in the months ahead in the life of our church, the Sunday worship and daily ministry of your congregation will continue to be there for you in the future just as it has been in the past. We will not become something other than what we are and who’s we are. God is faithful, and He will continue to bless and guide this diocese in the trying times that are before us. By His grace we accept the invitation, we embrace the challenge, and we renew the commitment – we will continue in the apostles’ teaching and fellowship, in the breaking of the bread and in the prayers. 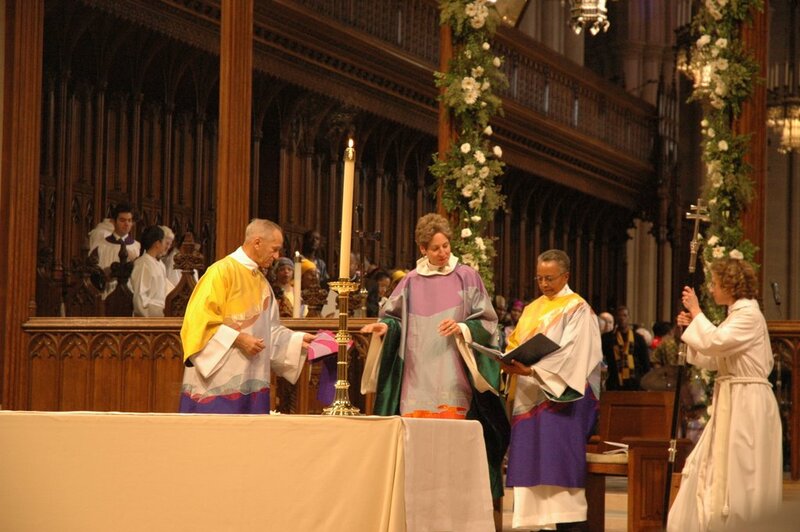 Given that the Episcopal Church in the United States, in its most recent General Convention, did not responsibly address the minimal recommendations of the Windsor Report, and that various dioceses and their new Presiding Bishop hold a position concerning human sexuality that stands in open contradiction to Lambeth 1998 resolution I.10 and the historic teaching of the Church: we renew our conviction that the Province of the Southern Cone of the Americas remains in impaired communion with the Episcopal Church; and given that their continuing position results in an extremely difficult situation for churches and Christians that do hold Anglican doctrine, and in the spirit of Kigali, we support our Primate and other Primates who are overseeing the development of a new ecclesial structure in the United States. There was extensive debate on both resolutions, though the opposition seemed to be focused in just a handful of parishes. Virtually the entire delegation from Trinity (Fort Worth, next to TCU) rose to oppose one or the other of the resolutions. There were also several opposition speakers from St. Martin in the Fields (Southlake). Other than those two parishes I recall one opposition speaker each from All Saints' (Fort Worth), St. Christopher's (Fort Worth), and Christ the King (Fort Worth). 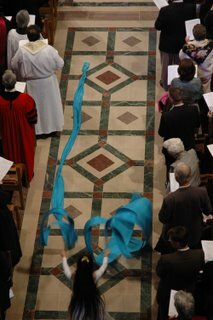 The number of speakers endorsing the two resolutions was great, and those speakers came from across the diocese. This leads me to conclude that, should there be stronger action taken by our diocese in 2007, the vast majority of the parishes would side with our diocesan leadership rather than the "815 loyalists" of Via Media. Four or five parishes might bolt, but the vast majority of the diocese would stand together in wishing to remain a constituent member of the Anglican Communion. I am much encouraged. What Will The Constitutional Amendment Do? The proposed constitutional amendment will reaffirm our commitment to the historic Anglican Faith and our membership in the Anglican Communion and our relationship with the Archbishop of Canterbury without having any direct ties to The Episcopal Church. We will continue to worship in the historic Anglican tradition as we have for the past 100 years and without fear that the actions of TEC will disenfranchise us from the rest of the Communion. What Changes Will You See If The Amendment Passes? First, you will be surprised by the changes you will not see. You will see no change in the worship services; they will follow the historic Anglican Faith as they always have. The prayer book and hymnals will remain the same. You will worship and attend services in the same buildings. Your clergy will remain the same. Best of all, Holy Scripture will continue to be our ultimate authority. What will change? The flag; the word “Episcopal” will most likely be replaced with the word “Anglican;” Our delegates and clergy will not attend the TEC General Convention. On the other hand, the Diocese could experience rapid growth if the amendment passes. For example, there are many large parishes in southern California which have seceded from TEC and have expressed interest in affiliating with an Anglican diocese headed by an American bishop. Initial discussions with a number of priests and parishes indicate a desire to find a way to become part of an orthodox diocese in Communion with the rest of the Anglican world and with the Archbishop of Canterbury. Is Our Place In The Anglican Communion Assured? Yes. First, we have a commitment from the Southern Cone (Archbishop Greg Venebles) that the bishops of his dioceses are open to our joining their Province. Second, the Global South, representing 80 percent of the Anglican Communion, issued a public statement known as “The Kigali Communique” in which it pledged to “take initial steps toward the formation of what will be recognized as a separate ecclesiastical structure of the Anglican Communion in the USA.” Diocesan representatives have been invited to meet with Primates of the Global South November 15-17, 2006, to begin work on this plan. The Diocese could be the vanguard of a new 39th Anglican Province in North America. At present, there are seven or more dioceses lined up behind us waiting to follow our leadership example. Are There Risks? Yes, of course. TEC is highly litigious and will likely file lawsuits in the California state courts seeking to take our property away. Our lawyers tell us we can successfully defend ourselves but there are risks inherent in any litigation. There will be significant costs of defending such lawsuits. However, property considerations are, and should be, secondary to our spiritual salvation and well being. Ours is a spiritual decision which should not be driven by property issues. We can seek guidance from the parable of the rich young man in Matthew 19: 16-22. Is there risk to our clergy? There has been considerable risk to me which is one reason why the release of this information comes just a few weeks before our Annual Convention. If you have been following the news, you know that standing strong for the Lord subjects one to reprisals and persecution from the leadership of TEC. I have been repeatedly threatened for my opposition to the heresy of the American Church. Formal charges were levied against me this summer by four California bishops. Immediately after a clergy wide meeting this October about the proposed constitutional amendment, the chancellor to the Presiding Bishop, David Beers, phoned and threatened to take action against me and Diocese. Clergy concerns over pensions they have been accruing are real. Yet, those with pensions of five years or more have vested (or protected) insurance against losing anything that is already due to them. Those who have been with the Pension Plan of the Church fewer than five years may be surprised to learn that other financial institutions are prepared to offer similar plans with a vesting taking place from the first day of participation. Clergy already assured of pensions that could be capped at the present level would also be able to add to their pensions in a new plan. The Falls Church and Truro Church in the diocese of Virginia, two of the largest parishes in nation, are scheduled to vote on departure from the Episcopal church on December 10th. Read the entire story here. Last Thursday night was Open House at St. Vincent's School. My seventh and eighth grade Western Civilization: Greece classes performed a dramatic reading of The Antigone for the visitors and parents who attended. A good time was had by all, and the students did a fine job. I am actually quite proud of our Western Civ course. This year the seventh and eighth graders are studying ancient Greece with me, with two and a half hours of class time devoted to the subject each week. (Next year the same grade levels will study ancient Rome.) So far this year we have read The Odyssey and The Antigone together, as well as having regular lectures on ancient Greek history and culture and introductory lessons in classical Greek language, with an emphasis on English vocabulary building. (All my students learned the Greek alphabet by the end of the first week!) Today we start reading Hesiod's Theogony together. In the spring term we will read portions of Plato's Republic and Apology and Aristotle's Nichomachean Ethics, as well bits of Herodotus and Thucydides. There will also be a unit on ancient Greek art and architecture. The Australian Broadcasting Corporation radio network has an interview with the new Presiding Bishop that is well worth reading. In addition to the comments quoted below on property disputes and the Communion, pay careful attention to what the "central mission" of the Church is according to the PB in the section I haven't quoted (hint--it is not proclaiming Jesus Christ as Savior). But on the property question, do these comments from Jefferts Schori indicate that she does not intend to fight tooth and nail for the property of the orthodox dioceses, even though her chancellor has been writing threatening letters to our bishops? Stephen Crittenden: Do you see a decade ahead perhaps of property battles and legal battles as being the inevitable outcome of this dispute in the church in America? Katherine Jefferts Schori: I sincerely hope not. There certainly have been instances in which individuals in a parish have wished to leave, and sometimes large numbers of individuals, and there have been gracious accommodations achieved in a couple of places around this church. I think it would be a sorry state indeed if we got to the point of squabbling over property without paying attention to what the centre of our mission is. Stephen Crittenden: But I think what is it? Seven diocese, or is it nine now, who have asked Rowan Williams for alternative oversight? What's going to happen? Katherine Jefferts Schori: I believe it's six, and I think the reality is that no one knows what alternative primatial oversight means. I think one of the things that the Archbishop of Canterbury's been very clear about is that his role in the communion is as Convener, and it is not as one who intervenes. His position is to call people to continue in conversation and relationship with each other. Stephen Crittenden: Bishop Jefferts Schori, what about the idea of the church as the mystical body of Christ, if you end up with a loose federation of churches which are more or less in communion with each other? Katherine Jefferts Schori: This body has been evolving as long as it's been in existence. When churching in America, when we had our revolution and clergy here could no longer swear allegiance to the crown, we found ways to move beyond that, and eventually we discovered a way to have bishops in this church that didn't involve swearing allegiance to the crown. That was the beginnings of the Anglican Communion. The Anglican Communion has evolved in fits and starts and it's clear that in this season there's an opportunity for us to grow into a new stage of relationship. What that's going to look like ten or twenty or fifty years down the road, I don't think anyone knows. The Archbishop of Canterbury has certainly done some conjecturing about what one possible route might be, but I think he's also been very clear that he doesn't think that there's one clear answer at this point. Mr Beers’s letter [to Bishops Schofield and Iker demanding their dioceses modify their constitutions] is consistent with remarks that Dr Jefferts Schori made in an interview with the magazine The Witness before the General Convention elected her as the new Presiding Bishop in June. A second letter, written by Bishop Jefferts Schori on 1 November, her first day in office, invited four of her fellow Primates to meet her during their visit to the United States in mid-November. The four are the Most Revd Peter Akinola of the Church of Nigeria; the Most Revd Dr Justice Akrofi of the Church of the Province of West Africa; the Most Revd Drexel Gomez of the Church in the Province of the West Indies; and the Most Revd Benjamin Nzimbi of the Anglican Church of Kenya. They will travel to the US for a board meeting of Anglican Relief and Development, a ministry of the Anglican Communion Network. They also will meet conservative Episcopalians who have expressed their desire for oversight from outside the Episcopal Church. Dr Jefferts Schori expressed her hope that the four Primates “might be willing to pay a call on me, so that we might begin to build toward such a missional relationship”. Primates of the Global South, when they met in Kigali in September, expressed the view that some “will not be able to recognise Katharine Jefferts Schori as a Primate at the table with us” (News, 29 September). While the The Living Church reported this meeting a couple of weeks ago, this is the first official confirmation I have seen. As indicated in the Kigali Communiqué (September 2006), we will be holding a consultation with the leadership of Episcopal dioceses requesting Alternative Primatial Oversight (APO). Our aim is to investigate their appeal in greater detail and identify possible responses. We will also meet leaders from dioceses who may not have specifically requested for APO, but will like to explore together what the steps forward may be. We will meet after the Nov 12-15 Anglican Relief and Development Fund (ARDF) Trustees meeting, at a separate location. Since these consultations are confidential there will be no provision for media access. We would, however, welcome your prayers. 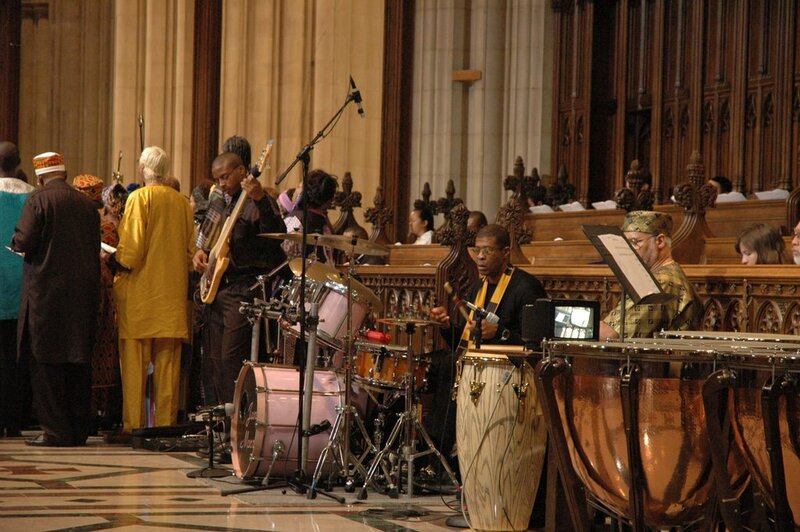 A number of the primates have also been sent an invitation by Presiding Bishop Jefferts Schorri. They will be responding to her in due course through private communication. Mr. Beers said there might be some symbolic gestures by Archbishop of Canterbury Rowan Williams to distance The Episcopal Church from the rest of the Anglican Communion. But he does not expect any formal break in part because too much of the Communion’s funding comes from the United States, both directly from The Episcopal Church and also through the Compass Rose Society. Even if formal action to recognize the Network dioceses as the legitimate Anglican Communion partner in the United States did come, Mr. Beers said it was unlikely that would change the outcome of a property dispute in U.S. court. Despite language in the preamble to the General Convention constitution which defines it as a constituent member of the Anglican Communion, the highest legislative body to which The Episcopal Church owes allegiance is General Convention. Communion ties are merely historical and symbolic, he said. Read the entire story from "The Living Church" here. Bishop Nazir-Ali Says an Anglican Split "Inevitable"
A split in the Anglican Church is inevitable with divisions between liberal and conservative factions "irreconcilable", a senior bishop says. The Bishop of Rochester, the Rt Rev Michael Nazir-Ali, told the Daily Telegraph there were "virtually two religions" in the Church. "Anglicans are used to fudging things sometimes but I think this is a matter of such seriousness that fudge won't do," Bishop Nazir-Ali told the Telegraph, in an interview while a guest at the convention. "Sometimes you have to recognise that there are two irreconcilable positions and you have to choose between them. ... The right choice is in line with the Bible and the Church's teaching down the ages, not some new-fangled religion we have invented to respond to the 21st Century." The deed is done, friends, and Katharine Jefferts Schori is now Presiding Bishop and Primate of the Episcopal Church. And a joyful noise was made unto the Lord by these fellows. You can collect all the images of this historic day here. According to the ENS story on this meeting, in which Bishop Bruno of Los Angeles played a leading part (he is implacably opposed to letting orthodox parishes leave with their property), the members of "Episcopal Majority" are "waging reconciliation." "We need to wage reconciliation, to constantly work for dialogue and conversation, reaching out and touching others who are different than us," Bishop Jon Bruno of Los Angeles told the gathering during a keynote address frequently interrupted by appreciative applause. Bruno quoted Presiding Bishop Katharine Jefferts Schori, on the eve of her investiture: "At our meeting at Kanuga, Katharine told a story about how whales come to the breeding ground, singing one song, but they go away singing a new and different song because they've listened and heard what each other sang." Odd, but the tone of the article seems to indicate that they are dedicated to rejecting the proposed Anglican Covenant and thwarting the activities of the Network and other "reasserting" Anglicans, rather than reconciling the orthodox to the national leadership. I am reminded of what was once said of the ancient Romans: "They would create a desert, and call it 'peace'." I suppose I should be relieved that they intend to eradicate us by "dialoging" and litigating us to extinction, rather than razing our cities and strewing the land with salt. ... At least, I don't think there will be salt! Conservative Anglican leaders are to flesh out plans for a formal split in the worldwide Church at a confidential meeting with the Archbishop of Canterbury, Dr Rowan Williams, later this month. A group of conservative archbishops, including the Primate of Nigeria, Archbishop Peter Akinola, will meet Dr Williams at Lambeth Palace to discuss the creation of a parallel body for conservatives in America. The development follows a summit of 20 “Global South” leaders in Africa last month, which opted for “a separate ecclesiastical structure” to accommodate opponents of the pro-gay leadership of the American Church. Seven dioceses and scores of parishes in the Episcopal Church, the American branch of Anglicanism, have rejected their liberal leadership and have asked to be “adopted” by a sympathetic archbishop from abroad. Under the Global South proposals, American conservatives would switch their allegiances from their Presiding Bishop-Elect, the Rt Rev Katharine Jefferts Schori, to a leader from the Global South. Dr Williams is thought to sympathise with their proposals because he is losing patience with the liberal Americans, who brought Anglicanism to the brink of schism by consecrating its first actively gay bishop in 2003. But he is also struggling to avert an unprecedented split that could trigger an acrimonious civil war within the Church of England, pitting bishop against bishop and parish against parish. Dr Williams said recently that his “nightmare” was that the worldwide Church would quickly disintegrate into rival groups, each demanding a share of the Church’s wealth in costly court actions. In the last few days the transcripts of two recent interviews have been published that are well worth careful reading. They shed considerable light on the present crisis in the Episcopal church. The first is an interview the Presiding Bishop-elect, Katharine Jefferts Schori, gave to NPR. In it Schori addresses comments she made to Time Magazine shortly after her election on the uniqueness of Christ's role in salvation (or rather, His lack of uniqueness). Amusingly, after reading Schori's recent comments to Time the interviewer ended her question with: "Are you a UNITARIAN?!?" Please read the entire interview here. One highlight from Schori: KJS "It-it-it says that Hindus and people of other faith traditions approach God through their... own cultural contexts; they relate to God, they experience God in human relationships, as well as ones that transcend human relationships; and Christians would say those are our experiences of Jesus; of God through the experience of Jesus. (RY: It sounds like you’re saying it’s a parallel reality, but in another culture and language.) KJS: I think that’s accurate... I think that’s accurate. The second piece is a Los Angeles Times interview with Bishop Gene Robinson of New Hampshire. In it he comments on his understanding of Anglican comprehensiveness. One quote conveys the flavor well: We don’t find our unity in a unanimity of opinion. We find it when we go to the altar rail and receive the body and blood of Christ — then we go back to the pews and fight about everything. You’ll find us all over the map on abortion, stem cell research, who should be president and everything else one can think of. It is fascinating to me how the Elizabethan settlement's tolerance for a range of opinion on disputed, marginal issues of doctrine and liturgical practice in the sixteenth century has been transmuted by the present-day left into an ethos of tolerance for pretty much anything under the sun (except "intolerant" traditionalist opinions). The good bishop apparently believes it is absolutely fine to share "the cup of salvation" together at the altar rail and then go "fight" over a host of hot button moral issues facing our denomination. While I would not insist that all members of our province must be in complete agreement on every contested moral issue, it hardly seems laudable to me that these kinds of divisions are common place within TEC--let alone that this divided status quo should be our paradigm for handling the present crisis. This is a long way from tolerating differences of opinion over whether or not there should be candles on the altar, a corpus on the cross or chasubles at the Mass! To the modern theological liberal it appears pretty much everything is adiaphora--even whether or not salvation is uniquely found in Jesus Christ!